Royal Boskalis Westminster N.V. (Boskalis) announces that Dockwise, a wholly owned subsidiary, has successfully loaded the ENI Goliat FPSO (floating production, storage and offloading vessel) onboard its largest heavy transport vessel in preparation of a transport journey to Europe. The loading took place in Geoje, South Korea and during the loading, the deck of the Dockwise Vanguard was submerged to receive the cargo. The Goliat FPSO is owned and will be operated by ENI Norge and was constructed by Hyundai Heavy Industries (HHI) shipyard in South Korea. The Goliat is the largest cargo loaded on the Dockwise Vanguard to date and has a diameter of 107 meters. The cargo will be transported around Cape of Good Hope, Africa, and will be offloaded in Northern Europe. After delivery of the Goliat, the Dockwise Vanguard will be mobilized to Rotterdam, The Netherlands, in preparation of its next assignment. On behalf of Bumi Armada Offshore, Dockwise will transport the Armada Intrepid FPSO, (formerly BP Schiehallion) from Rotterdam to the Far East. The 42,000 mt FPSO with a length of 245 meters and a width of 45 meters, is the first ship shaped FPSO to be transported onboard the Dockwise Vanguard. The Dockwise Vanguard is a unique vessel capable of transporting extremely large assets. 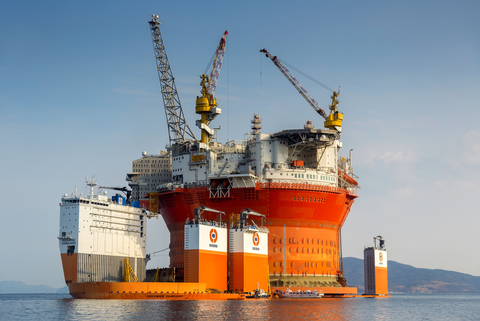 As the world’s largest semi-submersible heavy-lift carrier, she offers an unprecedented capability for transporting fully-integrated offshore structures and units, including FPSOs. The Dockwise Vanguard has a load capacity in excess of 110,000 tonnes, accommodated on an open-end, free deck space of 275m x 70m. The absence of a raised bow and conventional forward superstructure means that cargo overhang, either forward or aft, is possible. The vessel entered service in February 2013 (Boskalis).